HENDAY (Hendey, Hendry), ANTHONY, HBC labourer and net-maker, explorer; fl. 1750–62. Anthony Henday was one of the first white men to probe the vast distances of the Canadian west. There had been journeys to the interior before his time: Henry Kelsey* had travelled to the prairies in 1690–92; William Stuart* had crossed the Barrens to the country southeast of Great Slave Lake in 1715–16; but generally the Hudson’s Bay Company had not taken much interest in the all-but-unknown lands beyond Hudson Bay. 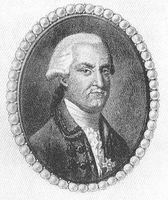 As Pierre Gaultier de Varennes et de La Vérendrye and his successors began to tap the western trade during the 1740s, however, the HBC became more concerned with what was occurring out in the vast territory its charter claimed for it. So when James Isham, chief at York Fort (York Factory, Man. ), suggested that “if a proper Person were sent a great way up into the Country with presents to the Indians it may be a means of drawing down many of the Natives to Trade,” the company’s London committee agreed. Henday volunteered to undertake the expedition. A native of the Isle of Wight, he had been a fisherman before joining the HBC in 1750 as a net-maker and labourer. According to Andrew Graham*, who knew him at York, he had been outlawed as a smuggler in 1748, a fact unknown to the HBC officials who hired him. After coming to the bay Henday had gained some experience in inland travel, having journeyed with a party of Indians as far as Split Lake in February and March 1754 to collect information on distances from York. On 26 June 1754 he set out with some Plains Crees who were returning to the interior. Following a route several miles north of the one that was to be used by the York-boat brigades of the 19th century, they left the Hayes River at the mouth of the Fox and travelled through Utik and Moose lakes to the Paskoya (Saskatchewan) River. Having been informed that in three days’ time they would pass a French post, Henday recorded apprehensively, “I dont very well like it, having nothing to Satisfy Them on what account I am going up the Country and Very possibly they may expect Me to be a Spy. . . .” When the party reached Paskoya (The Pas, Man.) on 22 July the French traders (one of whom may have been Louis de La Corne) did threaten to seize Henday and send him to France, but awed perhaps by the number of Indians with whom he was travelling they allowed him to proceed. He and his companions soon abandoned their canoes and struck out on foot over the immense prairies. After a few miles the Indians joined company with the members of their families who had not made the long journey by water to the bay. Henday was already travelling with a Cree woman whose assistance as food-gatherer, cook, and interpreter was invaluable. He does not mention her name in his journal, calling her only his “bed-fellow.” Reference to his relationship with her is excluded from the official version of the journal that Isham sent to London, for the committee’s disapproval of such arrangements was well known. The augmented party continued westwards, crossing the South Saskatchewan River north of present Saskatoon and passing south of the future site of Battleford. Its route, especially after it left the Battleford area, is a matter of some controversy. Henday’s original journal is not extant, and there are serious contradictions among the four copies that have survived. In any case, his brief entries lend themselves to various interpretations and, as the London committee later observed, “We apprehend Henday is not very expert in making Drafts with Accuracy or keeping a just Reckoning of distance other than by guess. . . .” The most recent and convincing attempt to trace his wanderings is in J. G. MacGregor, Behold the Shining Mountains. According to MacGregor, the travellers continued northwest and west along the southern edge of the Battle River valley. On 6 September they met a group of Eagle Indians, an Assiniboin band who had never traded with white men. Henday’s diplomacy was apparently effective, for thereafter groups of Eagles went down to York annually. The Indians whom Henday had come seeking, however, were those the HBC men knew vaguely as the “Archithinues” – either Atsinas (Gros Ventres) or Siksikas (Blackfeet). 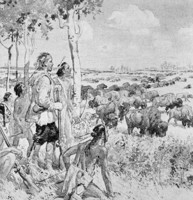 Attickasish, the Cree leader of Henday’s party, had met two Archithinues on 4 September, but the others were farther west following the main buffalo herds. On 15 September Henday recorded, “the Buffalo so numerous obliged to make them sheer out of our way.” As he and his companions proceeded they encountered numerous groups of Assiniboins hunting buffalo. On 14 October, when they were about 18 miles southeast of present Red Deer, Alta., they finally came to the great camp of the Archithinues – some 200 teepees pitched in two rows. At one end stood the buffalo-hide lodge of the head chief, capable of seating about 50 people. Attended by 20 elders, the chief received Henday, seating the visitor at his right hand on a newly dressed buffalo hide. Several pipes were lit and passed around without a word to break the silence; then boiled buffalo meat was circulated in baskets of woven grass, and the honoured guest was presented with 12 tongues – the greatest delicacy known to the Archithinues. The next day Henday met the chief again and, in keeping with the company’s instructions, requested that some of the young men be allowed to return to York with him. The chief replied that they could not live without buffalo meat or leave their horses, and that they did not know how to use canoes. He had heard, moreover, that the people who went down to the settlements on the bay often starved on the journey. “Such remarks I thought exceeding true,” noted Henday, who had only half-completed the gruelling journey after 16 weeks of travel by river, lake, and prairie. Henday and some of the Crees moved along to the area west of present Innisfail and Red Deer, where they spent the early winter. In this region they were within sight of the Rocky Mountains, but there is no clearly identifiable mention of this imposing range in the surviving versions of Henday’s journal. In mid-January they began making their way north-northeast, past the present Sylvan Lake towards the point where the Sturgeon River empties into the North Saskatchewan River (about 20 miles downstream from modern Edmonton). There they camped from 5 March to 28 April, building canoes for the long journey east. As they paddled down the North Saskatchewan they were met by bands of Indians who joined them or traded their furs to the Crees for English goods. Henday’s companions had promised him that they would try to persuade the Archithinues to come down to the bay, but although they encountered many of that tribe the shrewd Crees made no attempt to keep their word. Instead, as Henday observed, “there are scarce a Gun, Kettle, Hatchet, or Knife amongst us, having traded them with the Archithinue Natives.” It became clear to him that the Indian economy was more complex than the HBC had realized. Many of the Indians who traded at Hudson Bay had given up trapping and hunting, and had become middlemen for the rest of their own tribe or for the tribes of the interior who did not use canoes. When the flotilla, by then numbering 60 canoes, arrived at Fort Saint-Louis, some ten miles below the forks of the Saskatchewan, the French traders there began by offering their customers brandy and then traded from them about a thousand prime skins. The process was repeated farther down the river at Paskoya, and Henday reported “The French talk several Languages to perfection: they have the advantage of us in every shape; and if they had Brazile tobacco . . . would entirely cut off our trade.” After four days at Paskoya, with only the heavy skins remaining, Henday and the Crees started once more for Hudson Bay, following the same route as on their outward trip. On 23 June their astonishing journey ended at York. They had been absent nearly a full year. Henday had been farther into the western interior than any other European, and he had made valuable discoveries about the Indian economy and the nature of the company’s French competition. Some of his tales seemed so strange to the stay-at-homes at the bay that they were met with considerable disbelief. His claim that the Archithinues rode horses provoked particular scepticism and much laughter. After less than a week at York, Henday went inland again, accompanied this time by William Grover. Grover, however, was unable to stand the strain of the journey, and by 2 July they had returned to the bay. Henday had also apparently been affected by the hardships of his trips, for when Isham sent him inland in 1756 “to take a true and Exact acct. of the place he entemates, for a Settlement, computed 500 miles up,” ill-health obliged him to return to York without completing the mission. In 1758 he wintered at Ship River, an outpost of York, but became so ill “of a cold” that a party was sent out in March to bring him back to the main factory. He recovered and in June 1759 went to the Archithinue country once more. No journal of this trip exists. He travelled with a few Archithinues who had come to trade at Hudson Bay as a result of his previous expedition, and with Joseph Smith, who had already made several long inland journeys. Henday, Smith, and 61 canoes of Indians reappeared at York in June 1760. In 1762 Henday left the company’s service. According to Andrew Graham, who was at York at the time, he was disappointed at not being promoted and angry at being abused by the supply-ships’ companies for not buying luxuries from them. Thus ended the career of a “bold and enterprising” explorer who had contributed so much to the company’s knowledge of the lands it claimed and the people who inhabited them. [Henday’s original journal is not extant, and the four different copies that survive in the HBC Archives seriously contradict one another on some points. B.239/a/40 contains the copy sent from York by James Isham in 1755, inaccurate in some respects but ending with a powerful plea for inland expansion. In the manuscripts composing Andrew Graham’s “Observations” are three copies: E.2/4, ff.35–60, misdated 1755–56 and actually made about 1768–69; E.2/6, ff.10d–38d, written about 1767–69; and E.2/11, ff. 1–40d, possibly written as late as 1790 and including some valuable annotations by Graham. This version, the only one that has been published, appears as “York Factory to the Blackfeet country – the journal of Anthony Hendry, 1754–55,” ed. L. J. Burpee, in RSCT, 3rd ser., I (1907), sect.ii, 307–64. Clifford Wilson, “HENDAY, ANTHONY,” in Dictionary of Canadian Biography, vol. 3, University of Toronto/Université Laval, 2003–, accessed April 20, 2019, http://www.biographi.ca/en/bio/henday_anthony_3E.html.